It's certainly all smiles yesterday, as the team shook down the rebuilt cars on the Bugatti Circuit, with Nic Minassian getting some laps in. 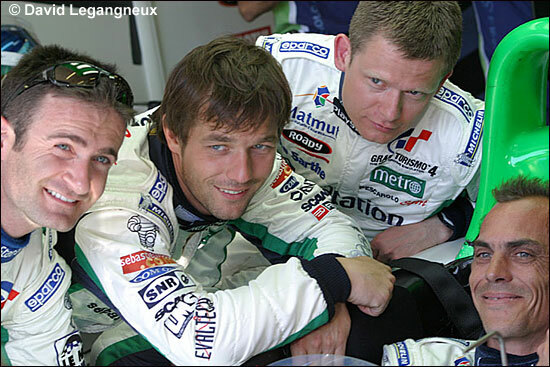 Here are Minassian, Loeb and Collard, grouped around Helary, in one of the cars yesterday. 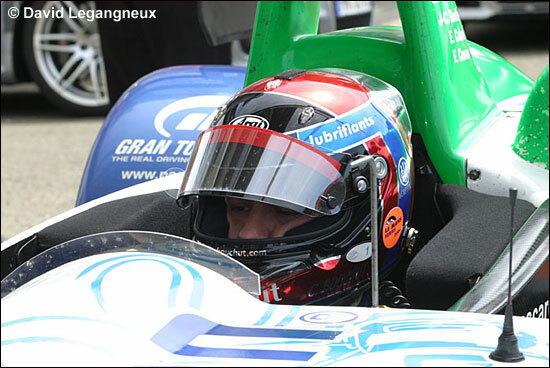 Meanwhile Christophe Bouchut has been providing his opinions on the shake-up that took place earlier this week, in the line-up in the #16 car. "They really put on me the maximum of pressure," he remarked in l'Equipe. "Like if you go off, you're fired. A flat [on the tyres] too. I wanted to avoid mistakes, to be at the level of my excellent team-mates. The traffic didn't help. Each lap, I had to overtake between five and 20 cars. In the Porsche curves, I lost easily one or two seconds." 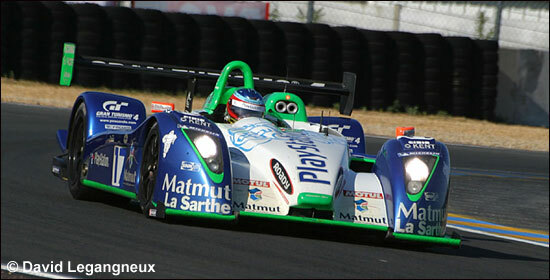 Bouchut completed around 30 laps at the test day, with a best of 3:39.990, on old tyres. 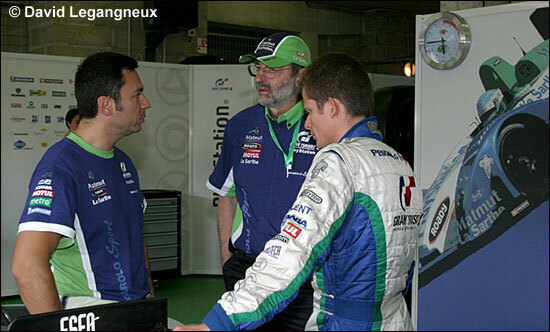 But by Tuesday, in Ouest-France, Henri Pescarolo remarked that "it was maybe too much asking him to be immediately competitive at the wheel of a prototype. A little more time and preparaton would have been needed to let him be able to fill the part we expected from him, in a car scheduled to fight with the two official Audis." 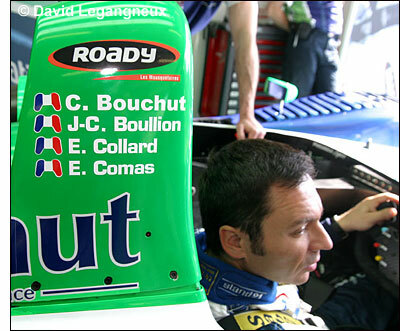 Bouchut's reaction (in Ouest-France) was fairly predictable: "It's him who came to find me. I've signed a clause of performance and integration in the team and I think I've carried out my contract. But they put me under huge pressure. My task was to not break the car and make laps in decent times. I was given the wheel at 12h30 for half an hour. 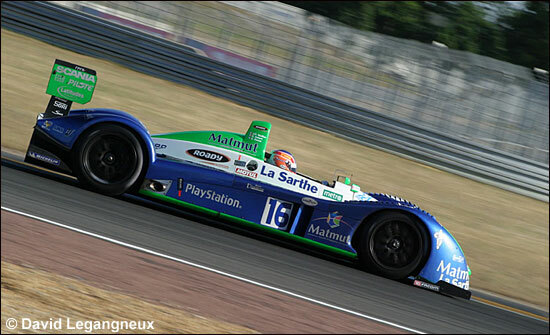 Then I went back on track at 14h with full tanks and old tyres. Not ideal. But despite that, I've made times close to those of Comas. I think it was not too bad for someone who hasn't had time to assimilate the car. It is inadmissible to play with someone like this. Who sows the wind reaps the storm. Now it's the law which will decide." "He may have arrived at the required level for the race, but despite the big respect I have for him, this "may" was too much because it was imperious to not to compromise our chances against Audi," was the last word from the team owner, in l'Equipe. 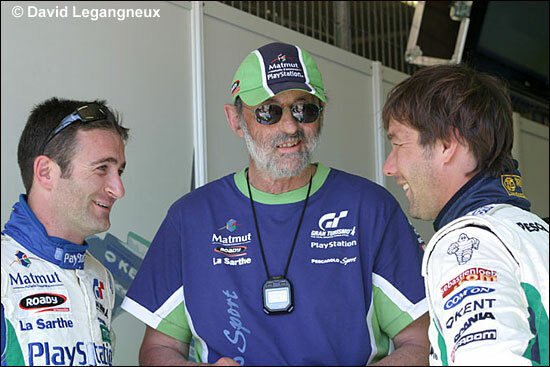 More smiles below (Minassian, Pescarolo and Loeb) - and Nic Minassian has probably got a smile on his face inside his helmet, in the image at the foot of the page.